Yesterday I had a dream of Sri Skanda. I dreamt that I was with my father in our old car, an Oldsmobile. It had broken down and my father had it towed. I wondered why the car broke down since it was running fine all this time. However, my father got in another vehicle, whose description I cannot recall, while I was to follow my father in our second car, the Chevrolet Corsica. Normally, when the Oldsmobile gives problems, my father calls me to come and pick him up with the Corsica. This time, however, he drove away in another car and didn't accompany me. When I started the Corsica to follow my father, I saw someone in the passenger seat. It was Sri Skanda! He was seated right beside me and was smiling. He was dressed and looked exactly like the picture seen on the Skanda Book by Hilda Charlton. Immediately, I put my hands together and repeated,"Muruga! Muruga! Muruga!" I repeated this 15 times. As I finished saying His name, Bhagavan Skanda vanished from beside me. I then drove home and in doing so, awoke from my sleep. This dream gave me three profound insights. Firstly, whenever I start driving a vehicle, be it my car or anyone else's, I always say a prayer to Lord Skanda. I always say,"Muruga!" once and then start. In doing that, I have surrendered myself to Him and know that He will bring me safely to my destination and back home. Secondly, this dream showed me that Sri Skanda is seated right beside me. Moreover, there have been times when I would be travelling home and would sometimes fall asleep in the driver's seat. I would then be awakened by a sudden jerk of my arm. But noone was driving with me. I am alone in the car. I always wondered who it was that saved me. I would assume it was probably Sri Skanda who saved me from driving into another lane where a truck would have collided and perhaps killed me. This dream revealed to me that it was Lord Murugan who saved me all those times I was very close to being killed or seriously damaged in a motor-vehicle accident. I now know the value of my prayers, which to this day have never gone unsaid to God before I begin my travel. Interestingly enough, I didn't realize the third aspect of this dream until a few months later when the Oldsmobile broke down and had to be discarded! We tried fixing it but the problems kept reappearing and soon the time and cost factor made it not worthwhile to spend anymore in reparing the vehicle. So, we decided to discard the car. It was July 10th (almost three months since I had the original dream in May 12th) and my mother, a close family friend, and I went to a Honda Car Dealer. Before we went, I said a prayer,"Muruga, please help my parents find a decent car. Please protect them from greedy dealers who would trick them for their money." After we signed the papers, we drove to a nearby Temple and I saw a bright rainbow. Immediately, I said Sri Skanda's Mantra three times. 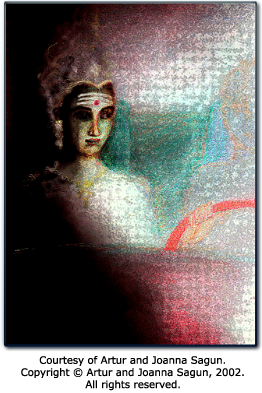 Sri Skanda showed me a sign that He had heard and answered my prayer. The car, too, was blessed by Him as He showed His approval with the rainbow! So you're probably wondering what this had to do with the dream? Well, a few days later when we went to pick up the new car, my father came and drove home in the new vehicle and I drove home in the Corsica! Just like in the dream! Lord Murugan gave me a premonition of this event almost three months prior! Just like in the dream, I was driving home with the Corsica while my dad was driving home in another vehicle! It was not just another vehicle, it was a special vehicle chosen and blessed by Bhagavan Skanda. By His Grace, I experienced this event before it even took place.